A study published in Medicine & Science in Sports & Exercise found beetroot juice is abundant in nitrate, which widens blood vessels, optimising your oxygen intake for extra energy. 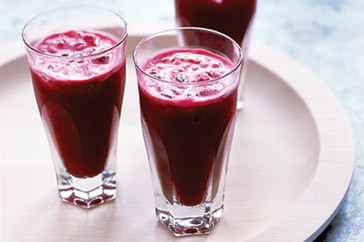 A test showed that drinking 400 ml of beetroot juice gave cyclists almost a minute off their 10 mile cycle times. Not only does it boost your stamina but it also lowers the blood pressure. The researchers believe their findings could help people with cardiovascular, respiratory or metabolic diseases - and endurance athletes. I drank 16 ounces of beetroot juice before my daily swimming training session and I did improved my overall times...will try other several times before jumping to a conclusion but I must say that I really enjoyed it! Nice of you to comment on this article. Are the effects really that great? Keni is sharing his secrets in his Superman Stamina video series. He claims that the key to keeping a girl fascinated by you is your ability to offer her satisfying orgasms. According to Styles, a girl will stray to another man that can provide her with sexual satisfaction if you'll’t offer her with it. Plus, he also claims that a woman will never actually be attracted to you if you'll’t provide her with orgasms from penetration. But luckily he claims that providing these types of orgasms to ladies is actually comparatively simple and simply needs the right quantity of endurance and a steady rhythm.